When Michael Bray put a call out to review his latest book I jumped at the chance. 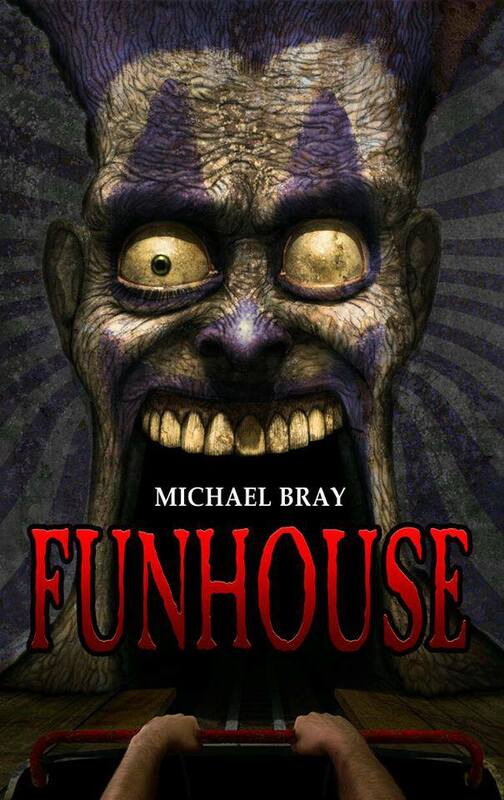 Introduced to Michael via another book all together I was super excited to give Funhouse a chance. And Yes in the past I have posted about my dislike of short stories I knew I was in for a good ride with Funhouse, as I had been with Michael’s previous book. And I couldn’t of been more right. Funhouse is a book that from the beginning grabs you by the throat and doesn’t let go til the end. Each story has its own unique twist, and each twist is more horrifying then the last. Not only will it having you wonder what goes bump in the night, but it’ll have you wondering whose knocking on your door in the middle of the day. This book gets your mind going, gets you thinking about what is out there, who is out there and what could they possibly do to you? Now like i’ve said in the past I am not a fan of short stories, but these short’s were not as short as the title short story would lead you to belive. In fact they could be short length novella’s. Definitely left to stand on their own. Each story draws you in, introduces you to the character or characters you are supposed to care about, and then drops the floor out from under you and drops you at a 100 miles per hour through every twist and turn that Michael can come up with. Not only is Michael’s story telling masterful, it draws you in and holds you close, whispers dark and disturbing things to you, and leaves you unable to breath. Each story is unique in its own right, the ideas are fresh and exhilarating, leaving you wonder what could happen next, or how it could have happened the way it did. I know that I enjoyed these stories thoroughly. The only problem I had with this entire set was, Michael you never let us know what was behind that last door, and I’m a deep dark and disturbed mind and I Need to know what it was! Michael Bray is a Horror author based in Leeds, England. Influenced from an early age by the suspense horror of authors such as Stephen King, and the trashy pulp TV shows like Tales From The Crypt & The Twilight Zone, he started to work on his own fiction, and spent many years developing his style. In May 2012, he signed a deal with the highly reputable Dark Hall Press to print and distribute his collection of interlinked short stories titled Dark Corners, which was released in September 2012. His second release was a Novella titled MEAT which was initially self-published before being picked up by J. Ellington Ashton Press. His first full length novel, a supernatural horror titled Whisper was also initially self-published, and following great critical acclaim, was optioned for a movie adaptation and sold to Horrific Tales publishing – his first Advance paying sale. Future works include the short story collection FUNHOUSE, which will be released through Dark Scream Publishing, and a new novel titled From The Deep, which is to be pitched to agents/ publishers upon completion. The Sovereign Spirit Saga; Volume 1, By David P. Forsyth.